This is a very different book than what I’ve written in the past. Over the last decade I’ve come to see self defense as part of a larger goal, which is keeping myself and my loved ones safe from harm — no matter what the threat, natural of man-made. Having emergency kits or taking a trauma medicine class is just as much about safety as buying a gun or taking a defensive shooting class. So many people I’ve talked to, though, see them as separate and non-related activities. Because of that they over-spend in some areas and under-spend in others. They often tell me they don’t have time for further preparedness, or are confused about what they should do next. Some say their budgets are an issue, and some just feel overwhelmed by the whole process — and end up doing nothing. What they need is a game plan, but nothing really exists to show them how to plan! That’s why I wrote Prepping for Life. This book isn’t about what you should do, but rather how to make living a more secure and prepared existence a daily event. In the book I show you how to identify the threats you really face; a quick and easy method to “rank” them so you know which needs attention first; how to plan and budget your preparedness activities; how to avoid gaps and wasteful duplications in your preparations; how to keep yourself on track and make steady progress; and most importantly, how to tell when you’ve done “enough”. Prepping for Life gives you balance in your life by giving you a framework, a structure, for fitting everything you need to do into your busy life. Nothing in the book is “one size fits all”; instead, the Adaptive Personal Security method I show you will help you prepare for the dangers you face in your life. You’ll learn how to prepare for your “worst-case” scenario without turning your home or lifestyle upside-down. You’ll learn how to equip, train, and maintain your preparations with a minimal amount of disruption in your life. Preparedness is about surviving natural disasters, but also about defending against criminals — and much more. 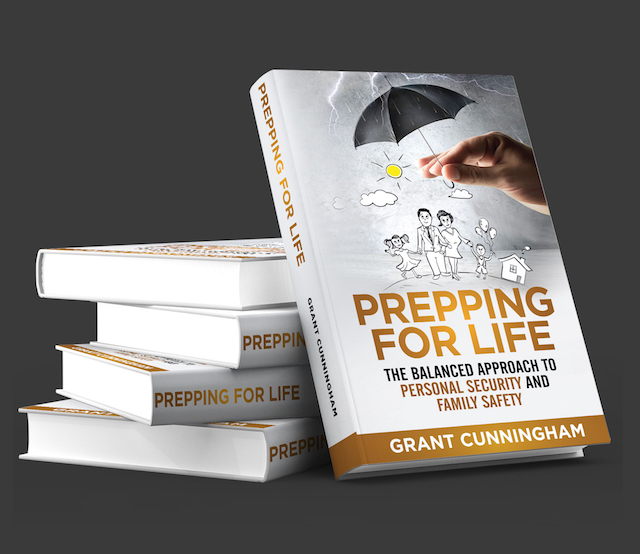 Prepping for Life shows you how to integrate every part of your personal and family safety preparations so they make sense for you. P.S. : Prepping for Life will be available in print form, as well as Kindle and iBooks formats! Hey Buddy!, I found this information for you: "Coming next Tuesday: “Prepping For Life” launches!". Here is the website link: http://www.grantcunningham.com/2017/07/coming-next-tuesday-prepping-life-launches/. Thank you.